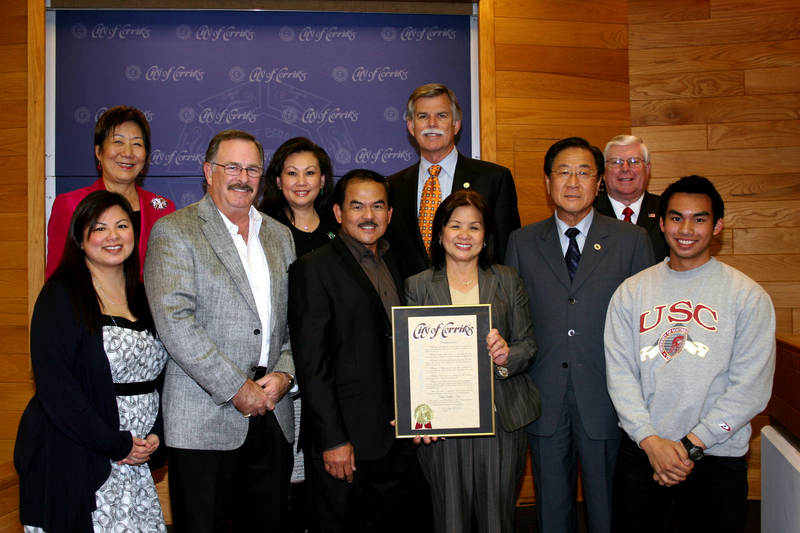 Proclamation presented February 10, 2011 to Twin Eagles, Inc. at Cerritos City Council Chambers. Twin Eagles Grills was created in 2000 by the award winning designer Dante Cantal, who developed cooking systems for many national restaurants and hotel chains. Cantal's engineering, creativity and handcrafted design have made him a leading designer in the barbecue industry. Today, Cantal's dream to build the finest residential gas barbecues in the world continues and his legacy of innovations speaks for itself. After graduating as a mechanical engineer in the University of St. Tomas in Manila Philippines, Cantal immediately went to work designing indoor appliances for the Philippine Appliance Corporation (Philacor). In 1982, he moved to the United States and worked for the U.S. Range Company designing commercial gas ranges. Since then, he has worked as a product engineer and as head of the engineering team for different companies designing commercial cooking equipment for hotels, casinos and restaurants. These early experiences set the stage for Cantal's transition to outdoor cooking appliances and led to his next designs — the Lynx Professional Grills, Delta HDS (from which the Dynasty, Maytag and Jenn-air Grills were born), the Ducane Meridian and Calspa Calflame grills. The company's commitment to original equipment manufacturing (OEM) progressed and to this date, Twin Eagles manufactures high-end OEM products for a very well-respected national appliance company. Twin Eagles and Dante Cantal continue to define the art of outdoor cooking with a broad line of gas barbecues and other professional-grade products to equip the outdoor kitchens of even the most discerning backyard chefs. It is no coincidence that Twin Eagles is successful in a business that focuses on the importance of backyard family gatherings and traditions. They have produced products that are industry firsts. Cantal's innovations were aptly recognized. In 1995, he was introduced as a Fellow to the Institute for the Advancement of Engineering. In 2000, he was the recipient of the Art Theobald Award, the highest honor given by American Society of Gas Engineers (ASGE) to a member. This award recognized Cantal's long-term dedication and numerous achievements in the gas industry. He served as the ASGE West Coast Chapter President in 1993 and 1994. A Certified Gas Engineer, Cantal continues his dedication in the gas industry and served as president of the ASGE National Office from 2007 to 2009. Cantal is a member of the Filipino American Association of Anaheim Hills and the Filipino American Chamber of Commerce of Orange County. He received the Entrepreneur of the Year Award in 2005 and in 2006 he earned one of the Top Ten Outstanding Filipino Awards. Twin Eagles, Inc. is located at 13231 East 166th Street Cerritos, CA 90703. For more information, please contact them at (800) 789-2206 or (562) 802-3488 or visit the company's website at twineaglesbbq.com.